We had a blast during the 2011 Black Mountain B&B Visions of Sugarplums Christmas Cookie Tour! It was great meeting visitors to the Inn on Mill Creek and sharing our little neck of the woods — and our cookies! We had the awesome Jo Northup performing on hammered dulcimer and flute for guests. And the tour benefited a wonderful charity, the Swannanoa Valley Christian Ministry, which provides local residents and stranded travelers with basic and emergency assistance. The SVCM has a food pantry, coordinates the Meals on Wheels program, works with the local homeless shelter, helps those in need with critical financial assistance, and aids in finding job opportunities, job training and educational advancement. Their work is so important in our community and we’re extremely grateful to everyone who bought tickets to the Cookie Tour to help out this great group of volunteers. This being our first Cookie Tour, we wanted to do a cookie that was special, and yummy of course! When thinking of ingredients, two of our favorite things are chocolate and mint. Put them together and you have a cool cookie combo. 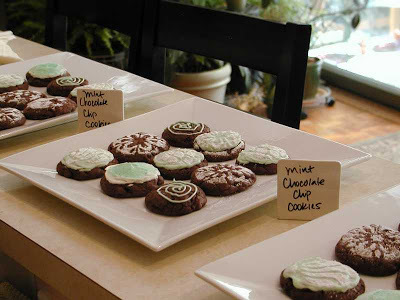 And you know we like to share, so here is our recipe for Mint Chocolate Chip cookies! This entry was posted in Uncategorized and tagged Recipes by Inn on Mill Creek. Bookmark the permalink.